I’m still mourning the dream of political revolution, but on the last night of the DNC, Clinton made voting for her a bit easier. After two weeks, and two conventions, and more Pepsi than I’d normally drink in a year, I don’t think I’m capable of rational analysis. But then convention speeches aren’t really about policy. Barack Obama, the most talented politician I ever expect to see in my lifetime, showed he knew that back in 2004. Al Gore never figured it out—and look what happened to him. Hillary Clinton, as she’s admitted many times, is not a natural politician. “The service part has always come easier to me than the public part,” she said tonight. And the early indications were not promising. And the shift from the quiet, devastating dignity of Khizr Khan, whose son, Humayun Khan, gave his life to save the men under his command in Iraq, to the spectacle of an audience with phone screens lit up dancing to Katy Perry’s “Roar” nearly made my head explode. I still won’t be surprised if Obama pushes TPP through the lame-duck session of Congress. But if he does, the fault will be ours, not Clinton’s—and “the biggest investment in good-paying jobs since World War II” is exactly what the economy needed, and never got, from Obama. I’m #StillSanders, still mourning the dream of voting for political revolution, still feeling the Bern. But after months of compare-and-contrast with Bernie, tonight I just let myself listen to Hillary. Sure, I know her record. And if you live in a safe state, and can’t imagine voting for the kind of Democrat who fills the stage with soldiers and the Wells Fargo Center with celebrities and flags and fireworks, I’m not going to argue with you. But sitting here, tonight, listening to Hillary Clinton, I began to imagine what it might actually mean if that woman in the white pantsuit—Dorothy’s daughter and, despite everything, still Bill’s wife—becomes the most powerful person on earth. I try not to be naive. And I lived through Margaret Thatcher’s reign in Britain, so I know perfectly well that arbitrary and destructive authority comes in all genders. 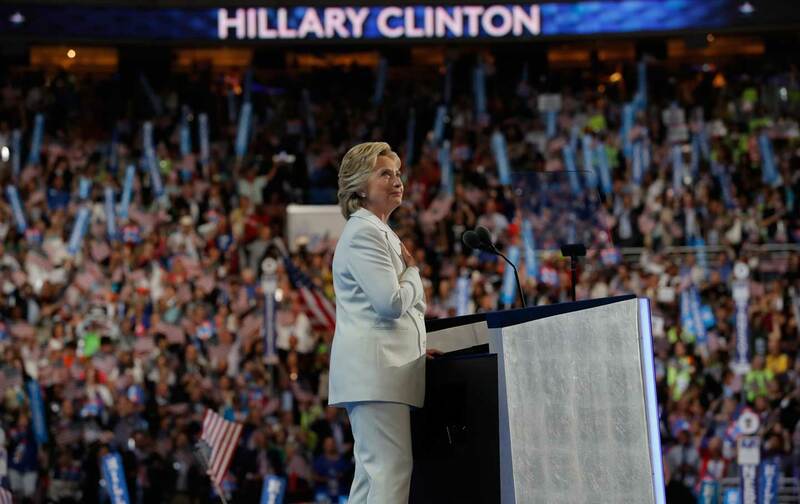 But tonight I began to think Hillary Clinton might really be different—that the mother who listened to Chelsea gush about A Wrinkle in Time, and who fought hard for children with disabilities, and against racism in housing and education, was still in there, underneath the power suits and the dark glasses, just waiting until it was safe to come out. When I sat down in the press stand tonight, I wanted to find out whether, in this one-man focus group, Clinton could move the needle. And I am bound to report that she did. I’m too old to think staying home on Election Day is anything but petulant—and too frightened of what Trump would do to this country to vote for a third party. So she didn’t really have to sell me. But she did make it a bit easier. Listen to D.D. Guttenplan discuss the DNC on this week’s episode of Start Making Sense.